Thistles Shopping Centre, Stirling took part in Purple Tuesday, the UK’s first-ever national, accessible shopping day. Thistles, Stirling provides a host of facilities and additional services which assist disabled shoppers. The centre offers 35 disabled parking spaces which are larger than the recommended sizes, two out of three of the main entrances to Thistles are step free and there is step free access to all stores as well as lift access for shops which have a mezzanine floor. Coloured stair noses for partially blind customers have also been installed. Disabled toilets and baby changing facilities are located next to Zara. Shopmobility, which is located in the bus station foyer, is open between 10am and 4pm, Monday to Friday and can be contacted on 01786 449606. The centre offers free wheelchairs when Shopmobility is closed. These can be requested from the Information Desk. Thistles also has disabled refuge points throughout the centre. Sainsbury’s within Thistles will be implementing a number of initiatives on Purple Tuesday including holding two Quiet Hours between 9am – 10am and 4pm – 5pm. This will see automated tannoys and music, as well as self-checkout audio all turned off. Lights will be dimmed in store and communications to customers will take place via social media and PR during both Quiet Hours. “Thistles is pleased to be supporting Purple Tuesday, an initiative which reaffirms our commitment to creating a positive experience for customers with disabilities. “Almost 20% of adults in the UK have a disability, 80% of which have an invisible or hidden impairment. This means that four out of five disabled shoppers may require some sort of support. 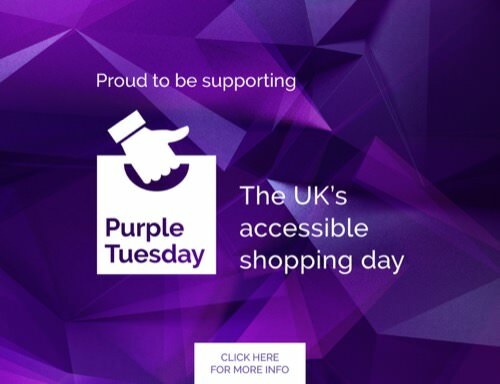 “We are delighted that Thistles, Stirling is supporting the Purple Tuesday campaign to promote better accessibility for disabled shoppers. The commitment by Thistles, Stirling to support Purple Tuesday is the latest initiative by the centre to benefit those with disabilities or impairments. Quiet Hour in partnership with Scottish Autism takes place on the first Sunday of every month and sees participating retailers adjusting their lighting and turning off in-store music, generating positive feedback from the public. Guide Dogs for the Blind is the beneficiary of free mall space on the last weekend of every month. Dog and puppies on the mall interact with customers and to date the charity has raised £4,498 thanks to the generosity of Thistles shoppers. Forth Valley Sensory Centre provided free training to a number of Thistles staff members to assist with visually impaired shoppers following the centre’s 40 Good Deeds Campaign. The training has proven highly beneficial and Thistles plans to put all on-floor team members through it to further strengthen the level of customer service offered. Forth Valley Disability Sport was welcomed to Thistles as part of the Special Olympics GB 40th Anniversary Games, which was hosted by Special Olympics Scotland and took place 9th – 13th August 2018 in Stirling. FVDS provided information packs for participants and attendees of the games. As a registered charity, the FVDS team sold merchandise from mall space provided by Thistles and offered photographs with their mascot. The games attracted 3,000 visitors and FVDS raised £1,320 from merchandise sales.